My Morning Jacket frontman Jim James released a new solo album, Uniform Distortion, back in June via ATO and a couple of weeks back he released another one, Uniform Clarity, that featured acoustic versions of the songs found on Uniform Distortion. He recently stopped by The Tonight Show Starring Jimmy Fallon to perform "Over and Over," a protest song of sorts, and was backed by The Resistance Revival Chorus. Now a new video has been shared of James and The Resistance Revival Chorus covering Sly & the Family Stone's "Everyday People" backstage at The Tonight Show. Watch it below. James released an excellent solo album, the politically-charged Eternally Even, in the fall of 2016 via ATO (it was one of Under the Radar's Top 100 Albums of 2016). Last December James released Tribute To 2, an album of covers that was the sequel to his 2009 George Harrison covers EP Tribute To (which was also reissued last year). My Morning Jacket released their last album, The Waterfall, in 2015. 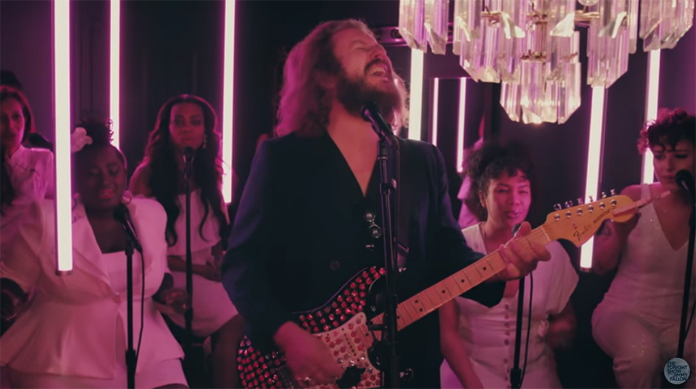 Read our 2015 interview with Jim James about the album.